Canadian Business Council Abu Dhabi - MENA Political and Economic Overview | What is next for the Gulf? Join the Canadian Business Council Abu Dhabi and various business groups in Abu Dhabi for an informative session on MENA Political and Economic Overview | What is Next for the Gulf? 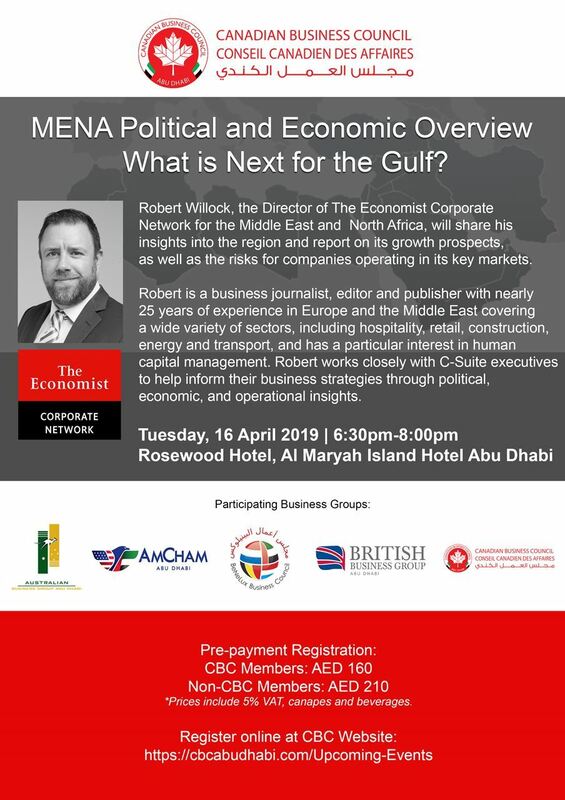 Robert Willock, the Director of The Economist Corporate Network for the Middle East and North Africa, will share his insights into the region and report on its growth prospects, as well as the risks for companies operating in its key markets. Robert is a business journalist, editor and publisher with nearly 25 years of experience in Europe and the Middle East covering a wide variety of sectors, including hospitality, retail, construction, energy and transport, and has a particular interest in human capital management. Robert works closely with C-Suite executives to help inform their business strategies through political, economic, and operational insights.